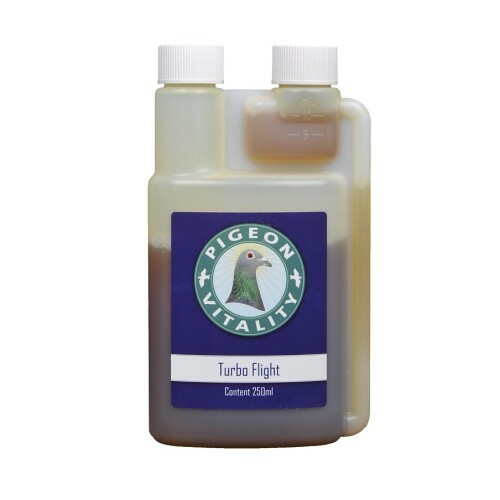 Turbo Flight 500ml by Pigeon Vitality is a new Remarkable & Natural Product Discovery from Pigeon Vitality: “Turbo Flight™” – designed to increase the speed in the race!. Results of tests show that while flying on glycogen and carbohydrates (fats) in the blood streamand those stored in the liver, the pigeon can obtain higher speeds. - Add 1 dinner spoon Turbo Flight™ to 1 Kg grain. - Give the Turbo Flight™/grain mixture to the pigeons the day of basketing (morning and noon), basket them in the afternoon and race next day within 24 hours. - Give Turbo Flight only when the pigeons will stay one night or less in the basket. If the pigeons is not allowed to fly within 24 hours after the “Turbo Flight™ meal”, they will use their added energy for fighting in the basket.